The Only existing pic of me on the ice. The hair gives it away. Over the holidays I went ice skating for the first time in I don’t know how many years. The first few minutes were pretty much torture as I kept a death grip on the rail trying to think about what I knew about moving on two thin metal blades while trying not to think about all the things that could happen were I to fall off those blades. After a few deep breaths I was able to align myself and let go. 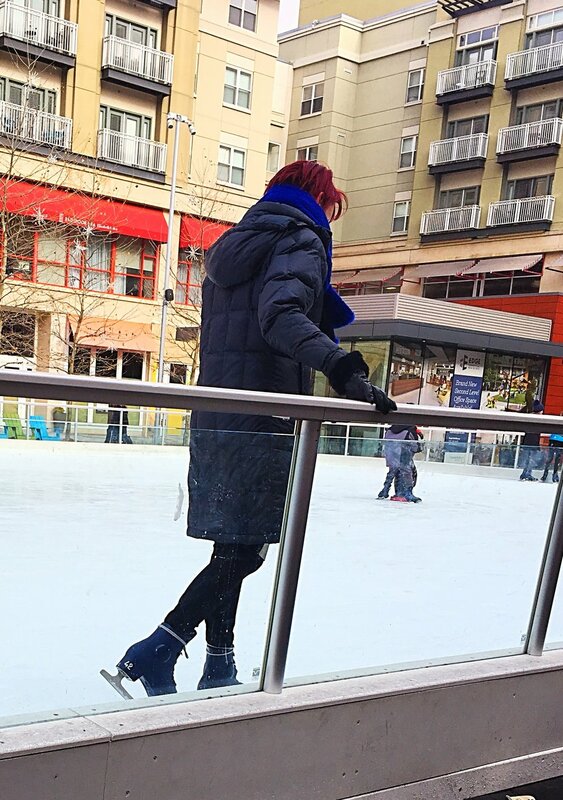 While attempting to glide somewhat gracefully around the ice I had some time to think about the fine art of balance. I’ve spent the better part of the last two years learning to dance. A lot of people questioned why I would do this, it wasn’t what I was known for why do it? Yet, from the moment I stepped into my first class, I knew that this was absolutely what I needed to be doing. And it has definitely paid off. Dancing has completely changed the way I approach performing. It’s given me an ease and physical freedom on-stage that I’ve never had, not to mention an entirely new element to add to my shows. So what’s the problem? In committing to learning this new skill I often feel that I have thrown my life dramatically out of balance. In order to master this new skill I have had to work at it intensely and that requires time, time which gets taken away from other things. Finding time for classes and sessions and practice consumes me. It also cuts into the time I have for other things. I have had to turn down invitations and ignore the dust bunnies colonizing under the sofa. Add to that finding the time to sing and write and promote and each day is a about four hours too short. Somewhere it occurred to me while dodging small sugar fueled children hurling themselves at me at great rates of speed that maybe it wasn’t that my life was so far out of whack at this moment but that what I needed was to change my idea of what living a balanced life means at this moment. The first thing that I realized was that in order to bring this new thing into line with all the other things I do professionally I HAVE to work at it constantly and intensively. There is no other way but to give myself over to the process in the short term so that in the long term I can confidently add this tool to my professional arsenal. In a sense, for a little while, this is my job. After that comes attention to all the other things that need constant tuning - the singing and writing and spinning new projects and promoting the old. Finally, come the social obligations and chores. Learning to live in harmony with the dust bunnies for a while is okay as long as there’s food in the pantry and clean underwear everything else can take a backseat. As for my social life, even if I can’t see my people as often as I Iike I can make sure that I am fully present when we are together, and that means putting work aside and not feeling guilty about it. I can’t do everything every day, but I can make sure that every day I’m doing what I need to do, and that is a great relief. And just maybe I’ll find a little bit of time to get back out on the ice.